The weekend has been great! I had the pleasure to work at Northern Slopes in Knowle, Bristol for the Wild City “Wildfest” and Northern Slopes initiative week. There were lots of events taking place such as live music, bird and bat box making, and an amazing selection of Falcons and Owls from “Owl Occasions”. I led a walk on the wild side with a fantastic group, looking at various aspects of wildlife and trees, and also their uses. 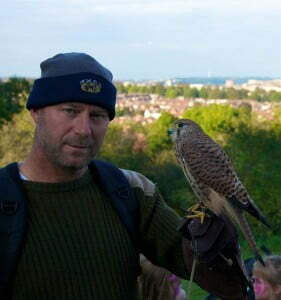 I even got the chance to hold a kestrel “KES”! A fantastic day, and the weather was kind too – ’twas like a summer’s day.